For Christmas last year, Namine received a terrarium. The box sat in her room for some time, until she decided to put it together and let it grow. Neither Jessica nor I even knew about it until we found it in her room, growing. Back in second or third grade (I honestly don’t recall, and I can’t find any pictures), Namine had a science experiment which she had to do for school. Inside the kit we’d received at the beginning of the year were several Mung beans, which were to be planted and placed in different places around the house: on a window sill to receive natural light, in the middle of a room to receive mostly artificial light, in the middle of a different room to remain mostly in darkness, and so on. Long story short, none of them grew very well. Namine did her due diligence of watering them at the specified intervals and recording their growth, but the entire experiment was not very successful. In case you’re wondering, she didn’t get a bad grade on the project. Her teacher (I’m talking about the RVA teacher, not us) accepted the work she did as sufficient. 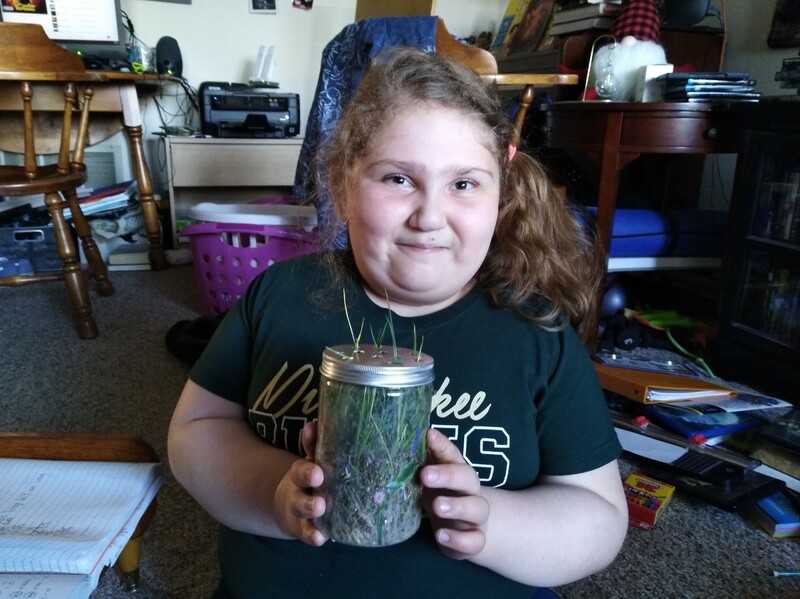 I know the circumstances of growing beans and a terrarium are quite different, but it still strikes me as funny that the science project she had to do for school failed so miserably, while the project she did on her own, with no adult supervision and completely for her own enjoyment, succeeded so well. The terrarium is still on the sill, growing and growing. The little lawn is due for a trim now, I think.